BBC NEWS | UK | Why did Prince Andrew and Prince Edward get knighthoods? Why did Prince Andrew and Prince Edward get knighthoods? One's a duke, the other's an earl. So why should they become knights as well? Prince Andrew, the Duke of York, is fourth in line to the throne. 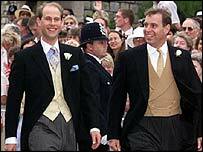 His younger brother, Prince Edward, the Earl of Wessex, is seventh in line to the throne. Above them on the pecking order is their brother, Prince Charles, and his two boys. Below them are somewhere in the region of 55 million Brits. In short, they have about as much status as anyone could wish for. So why have they just received knighthoods? As part of the celebrations to mark the 50th anniversary of her coronation, the Queen gave her two younger sons the honour of making them Knight Commanders of the Royal Victorian Order. The decoration means they can now use the letters KCVO after their names, but as a duke and an earl they are hardly likely to start calling themselves Sirs. Andrew's full title is now HRH The Duke of York KCVO ADC. ADC indicates he is a personal aide-de-camp (assistant) to his mother. He is also Earl of Inverness and Baron Killyleagh. Edward's title is now HRH The Earl of Wessex KCVO. He is also Viscount Severn. The different orders of chivalry, of which the Royal Victorian Order is one, have their own pecking order, and have different rules and privileges attached to them. This particular order is awarded personally by the Queen for services to the Sovereign. It is, according to Harold Brooks-Baker, publisher of Burke's Peerage, really just a way for the monarch to say thank you to her sons. The significance attached to the orders has been on the wane for years, Mr Brooks-Baker adds. In fact, he says, the different knighthoods are now considered virtually the same, with the differences only really being of an academic interest. But this is just a reflection of a decrease in the general level of awareness of the honours system. Very few people now even understand the terms, he says. "Even educated people today don't know the difference between a duke and a baron. About half the phone calls we get here are from people wondering about things like how to address a peer - a few years ago people would just have known these things. "But not now - it's as if they are dealing with a world that's virtually disappeared, which I suppose it has." That level of interest will in turn be reflected by a reduction in the number of people receiving honours, he says. Already it has been announced that Edward's children will not have the "HRH" title, and this trend is likely to go further. "I think the time will come in the not too distant future when only the monarch, the Prince of Wales, and their spouses will have titles," he says. "The same thing happened in Japan. The children of the emperor have titles, and that's it - when there used to be several hundred titles in the imperial family." But for now, Andrew and Edward can content themselves in the knowledge that they have their mother's approval.